Weather patterns in the Upper Midwest often make it difficult to field-cure hay below 20% moisture on a consistent basis. 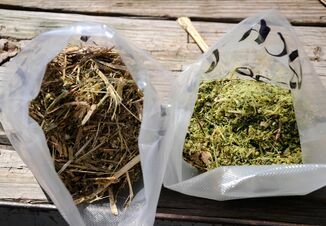 In some cases, growers may desire to harvest hay at higher moisture levels to reduce harvest losses from mechanical leaf shattering and improve forage quality. Thus, hay producers are always looking for methods and technologies that will either accelerate drying time in the field or preserve desirable feeding characteristics of hay harvested above the optimum moisture level for safe storage. One of the technologies used for preserving hay harvested above optimum moisture levels is to apply organic acids to the hay at harvest time. The use of organic acids has proven to be an effective strategy for preserving baled hay. Why are hay preservatives needed? When hay is baled and put into storage at moderate moisture levels (18% to 30%), a favorable environment exists for the growth of undesirable bacteria, fungi and yeast. Both moisture and temperature drive the population growth of these microorganisms. Fungi such as Aspergillus and Fusarium can produce a wide range of toxic metabolites and greatly reduce hay palatability. Organic acids, when applied at the proper rates, effectively control the development of molds on moist hay by preventing the growth of fungi and actinomycetes. Do all organic acids products have equal effectiveness? Not all organic acids or commercial organic acid products are created equal. The most commonly used organic acid for hay preservation has been propionic acid. Not surprisingly, it is also one of the most effective. Some commercial products also contain a small percentage of acetic acid. However, acetic acid is a less effective hay preservative. Be sure to read the product label for the actual percentage of active ingredient (i.e., propionic acid). Some products contain as little as 15% actual propionate. Base purchase decisions on cost per lb. of active ingredient and not cost per lb. of product. For many years, the major disadvantages of using propionic acid were its corrosiveness to machinery, pungent smell and volatility. To address these problems, buffered proprionic acid products were made by adding compounds such as ammonium hydroxide to the acid to form ammonium propionate. 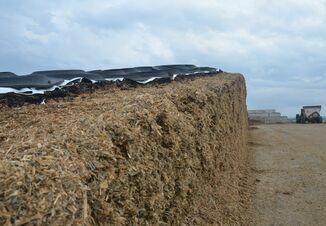 Several research studies have shown that the buffered product is equal in hay preservation qualities, but they are costlier than those not buffered. What are the economics of organic acid use? When figuring costs for using organic acid preservatives, include the expense for purchase and installation of application equipment and product cost. 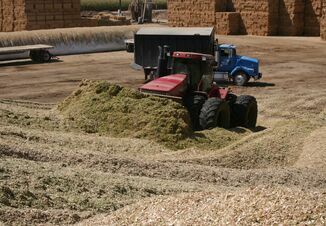 Small square balers usually can be equipped with a tank, pump and nozzles for $500 to $1,000. For large package balers, equipment costs range from $1,000 to $2,000. Buffered acid products cost about $1.10 per lb. of active ingredient. Unbuffered products typically cost $0.20 to $0.30 less per lb. Therefore applying 10 lb. per ton of buffered product costs about $11 per ton of treated hay. This does not include prorated equipment costs. However, these should be minimal on a per ton basis. Organic acid preservatives will be most economical to use when large acreages are baled and the product is used discriminately to avoid rain damage on cut forage. To read even more about organic acid use in baled hay, click here.